2. Universal and Blended Search Session, Day 1 – Dana is anxious to hear what is new in universal and blended search since last years’ session. 3. Igniting Viral Campaigns session, Day 1 – This session promises to unveil the secrets of Web 2.0 techniques and technologies to help small and mid-size businesses stand out amongst the crowd. 4. Expo Hall Opening, Day 2 – Discover the latest products and technologies relevant to online marketing and see what the big names in search are up to by stopping at the many booths for your complimentary branded goods. 5. Landing Page Utopia, Day 2 – A good landing page is key to the success of any paid online advertising campaign. Ensure your pages convert clicks to conversions by attending this session led by a panel of top online marketing experts. 6. Ashley and Dana “getting their groove on” at Google Dance – Don’t miss the social event of the search marketing industry. Bring your dancing shoes and get ready to network! 7. Q & A with Google – See what happens behind the curtain at Google in this exclusive opportunity to ask the insiders how the search giant deals with a variety of issues, from spam to paid links and beyond. 9. Successful Tactics for Social Media Session, Day 3 – This session covers some popular social media services to leverage for marketing as well as best practices to penetrate them. 10. Black Hat, White Hat: Play Dirty with SEO – Where do you stand on the Black Hat vs. White Hat SEO ethics issue? Learn both sides of the argument by attending this session. 11. Ashley and Dana “getting their groove on” at Webmaster Radio Search Bash – Let loose after a long day of stimulating sessions at this fun bash put on by Webmaster Radio. There is usually plenty to see and do to keep you busy late into the night. 12. Thursday Keynote: Chip Heath, Author of “Made to Stick” – Learn how to produce marketing ideas that translate into results from idea guru Chip Heath. 13. The 3G iPhone Local Search Demos Session, Day 4 – See how companies are using mobile technology like the iPhone to revolutionize local search on the mobile device. What are the odds that Lee will have bought the team iPhones by this time? 14. Best Kept Secrets to Search Session, Day 4 – Top search engine marketers share their go-to tricks and shortcuts for online marketing success in this interactive session. 15. TopRank Blog’s Coverage of SES San Jose – Check out TopRank’s Online Marketing Blog throughout the conference for regularly-updated reports in the form of session summaries, photos and insights from the TopRank team in attendance. You’ll feel like you’re there! For more info on the event, including a full conference schedule, hotel info and registration, check out the site for SES San Jose. Expo Hall Opening and the schwag, don’t forget the schwag. Hope to see you there! 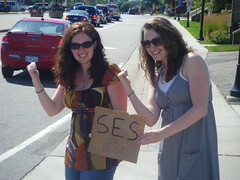 Girls, didn’t your moms tell you not to hitchhike? Gosh, now I wish I was going to SES SJ after all! Make sure to Live Twitter your journey! If you like Landing Page Utopia on Day 2, you should also check out Post-Click Marketing on Day 4 — a broader strategic discussion around what happens after the click. It’s pity I can’t be there! Can you post what’s happening and in particular, some useful and updated SEO tips shared by the speakers after the conference. I will surely check this out. Don’t forget about the SEMPO mixer on Monday night after the last session. Grab a free cocktail and join us for a speed-networking event! Like speed dating, but guilt-free. Nice post! Looking forward to seeing you guys there! Be sure to say “hi” if you see any of us from Enquiro there. You make me so excited about SES San Jose. This is my first year. Please say hello if you see me and I’ll do the same. Nice summary! “Meet the engineers” which is kind of tucked away at the Google party – is always a highlight for me. See you at SES ! Search getting all the credit? So true, and its time to realize how much advertising outside of search leads to that search query. Search Guys have been taking the credit all along. That’s changing, cant wait to see the new Atlas release where it weighs the View Thru Window and gives credit to where it should. Agencys and Advertisers that have atlas is going to have a field day with this data.